Universa Tax is dedicated to providing a prompt, personalised accounting and tax service to clients through specialist knowledge in certain sectors and efficient use of information technology. The company embodies the clarity and common sense of a firm with its roots in the personal services sector and the quality of service expected from Chartered Tax Advisers and Chartered Certified Accountants. 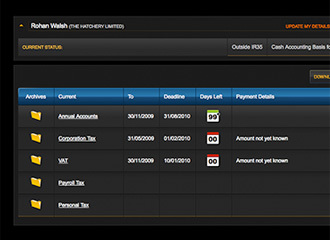 Automate a number of back office accounting functions and integrate the system with an attractive, client-facing website and secure, client-accessible area. This solution has been ported to Cloudbase™ and automates a number of accounting services and significantly improves the access that clients have to their accounts-related information. 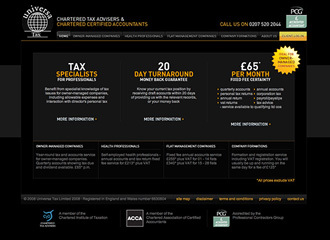 We not only built the brochureware website and integrated it with Cloudbase™ for Universa Tax, but also a secure, file management area where their clients can gain access to forthcoming accounting milestones, historical and current documents as well as perform certain common accounting tasks such as declaring dividends and uploading period-specific spreadsheets for accountant use.